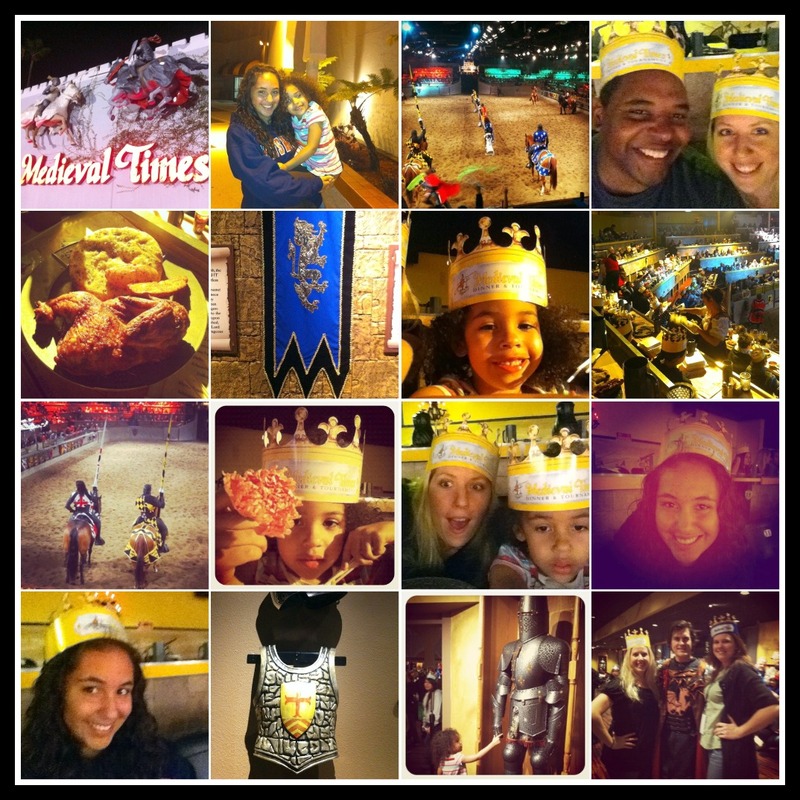 Taylar turned 14 last week, and we went to Medieval Times Dinner and Tournament to celebrate. It was was opening night of the all new show, and we were excited to be attending. I hadn't been there since before we had Kaia, and they've made a lot of changes since then. It's now a 2 hour show filled with more Rivalry and more Revelry! The lighting and the colors throughout were really vibrant, and helped bring the castle-inspired arena to life. There is more jousting, sword fights and horsemanship then ever before. And who says chivalry is dead, Taylar caught one of the flowers tossed by our Yellow Knight, which she immediately had to hand over to Kaia. (little sisters can be such a pain) They've enhanced menu options too, but still no silverware! They start you off with a hot cauldron of "Dragon Soup." (Tomato Bisque) The main course immediately follows with warm focaccia bread, oven roasted chicken, a spare rib and large herb potato wedges. (They also have a vegetarian option.) For dessert it's an apple pastry, pleasantly served warm. It was delicious especially with my decaf coffee. All of us (except my husband) took home to-go containers because it was a lot of food. The most important thing to me is my family and I love making new memories with them, even more so on birthdays and special occasions. Last night was one of those knights (pun intended) for us. We were happy to make our daughter's 14th birthday a memorable one. Medieval Times Dinner and Tournament is a unique Los Angeles experience that takes you back in time, when Kings and Queens ruled, and knights were the thing to be. Thank you Medieval Times for allowing us to enjoy all of the new action, and excitement! For more coverage on opening night, go check out my sister Becky's blog www.HappyHourMom.blogspot.com. And see my "Fresh Tips" below on how to make the most out of your night. Before the show make sure to visit the gift shoppe and purchase a flag for any of the younger members of your party. They cost next to nothing, but were priceless to us. Kaia was SO into the waving of the flags when it was our turn to cheer for our knight, she did it all the way home. (well half of the way, until she fell asleep in the car) FYI; the crowns are free! Disclosure: I was not paid for this post. I was given passes for me and my family to attend a media preview. The opinions on this blog are 100% mine and 100% fresh!